President Mnangagwa yesterday said he would soon expose land barons that fleeced desperate home-seekers especially in urban areas. The President said this while addressing thousands of zanu-pf supporters at Chinhoyi University of Technology (CUT) yesterday. He said Government’s new policy would prioritise construction of multi-story apartments to conserve land. “In our urban areas housing is a problem. We have people that are building everywhere without roads, water and sewer systems and other requisite infrastructure. That is now a thing of the past. That was done by the G40, it is now all over. Land barons you are warned we have a commission into that and we now have a commission of inquiry looking into that and from the preliminary report they have produced we now know who these land barons are although they have not yet finished their work,” said President Mnangagwa. He said he would name and shame the land barons like he had done with individuals and organisations that had externalised foreign currency. “Just like I did with those externalised foreign currency, I am going to expose the land barons. 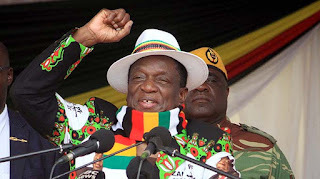 I was discussing with the RBZ governor the other day and he said so far $850 million had been returned to the country so I am saying to the land barons what happened to these ones will happen to you,” said President Mnangagwa. He also said Government was now promoting construction of high rise buildings. “We also now want to promote construction of high rise buildings that do not take up space because that is what modern developed countries are doing and that is what we want to do here in Zimbabwe," he added.